Or how to toggle a thousand checkboxes clicking none. Create an A/D group for each role/profile. 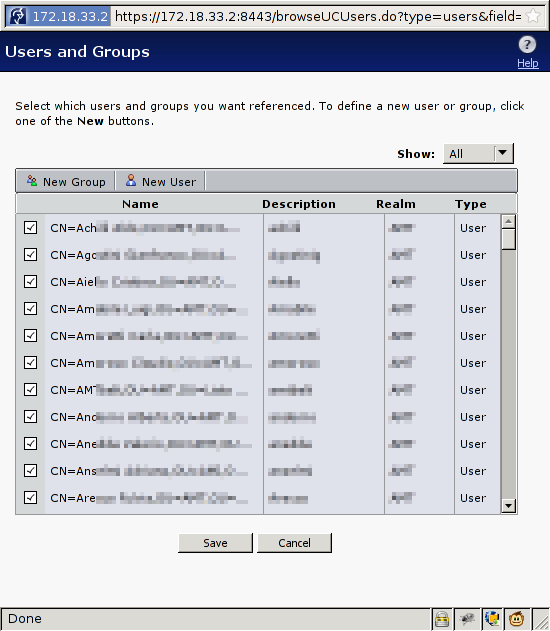 Configure permissions (rules, resources access, …) on various Communities (Aventail parlance for roles/profiles). Put the right Users into the right A/D group. Cleanup: generally, each Community should just have A/D groups assigned to it. Get rid of unnecessary Community memberships. Removing members from a Community means unchecking each User. In my case, more than one thousand clicks and a beginning of carpal tunnel syndrome. At page three I started to think about a less saddening way. Went to the page depicted above (the one that let’s you assign members to a Community). Inspected the DOM and noticed that each of the checkboxes value begins with “AV”. Hit the jQuerify button. FireQuery is needed because Aventail’s web-based GUI doesn’t use jQuery. which translates to: use jQuery to select all of the checkboxes whose value starts with “AV”. Uncheck the selected checkboxes. See? No useless clicking: a GUI has been CLI-fied.